The grasslands of Canada's Alberta province, on the eastern side of the Canadian Rockies, constitute 30 percent of Canada's arable land and are home to dozens of native sun-loving shrubs. Some shade-loving native shrubs, however, are quite at home in Alberta's wetlands and Rocky Mountain forests. In addition to brightening your landscape's shady spots, these shade-loving shrubs provide the local birds and wildlife with food and shelter. Checkerberry (Gaultheria procumbens) is a shade-tolerant shrub found in Alberta's oak woods and bogs. Reaching only 6 inches high, it has shiny, oval, green leaves that turn red with the first frost. 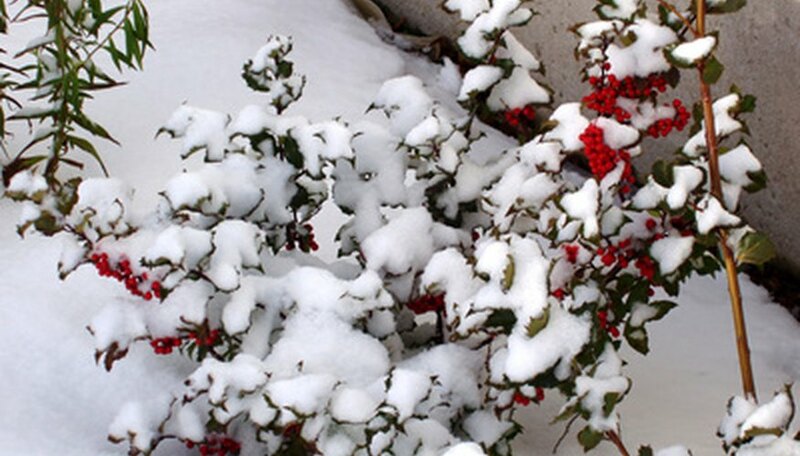 The 1- to 2-inch leaves remain on the shrubs through the winter. Between June and August, according to the Missouri Botanical Garden, this woody perennial has fragrant clusters of white or pale pink bell-shaped blossoms. Red wintergreen-flavored berries follow the flowers and are used in gum and candy. The shrub's leaves provide winter forage for grouse, deer and small mammals. Plant it as a ground cover in a partly shady to shady spot with acidic soil. Bog laurel (Kalmia potifolia) is an evergreen shrub standing less than 3 feet high. Found in Alberta's mountain meadows and cool bogs, it has attractive leathery blue-green foliage. Another mat-forming plant, it has trailing stems. Clusters of 1/2-inch bell-shaped pink flowers top its woody branches in May and June, says the Lady Bird Johnson Wildflower Center. Plant bog laurel in a shady, wet location. It likes acidic soil high in organic material or peat. Ingesting any part of bog laurel is potentially fatal. Highbush cranberry (Viburnum opulus var. americanum) is a 6- to 10-foot shrub that grows in part shade. It's a member of the honeysuckle family, not a true cranberry. Found in Alberta's cool woods and thickets, it has dense branches with maple-like green leaves that become reddish-yellow or reddish-purple in fall. Between May and July, the bushes produce flat clusters of fragrant white flowers. Clusters of edible bright red berries similar to cranberries follow in August and early September. If picked before completely ripe, they make good preserves and sauces, says the USDA Natural Resources Conservation Service. Berries remain on the shrubs into winter, providing food for birds and small mammals. Plant highbush cranberry in moist to wet, well-drained pH-neutral loam and part shade. Labrador tea (Ledum groenlandicum), according to Alberta Plant Watch, is a small evergreen shrub standing between 1 and 2.5 feet high. It's common in in the shade of Alberta's forests, peatlands, and bogs. There are narrow green leaves, aromatic when crushed, at the tips of the stems, where loose clusters of small white flowers bloom between May and August. This flood-tolerant plant is a major food source for Alberta's caribou. Its fresh or dried flowers and leaves make Vitamin C-rich tea. Plant Labrador tea in wet, acidic poor soil.